I live in a state that is actually two peninsulas. Most of Michigan’s borders are defined by 4 of the 5 Great Lakes. Within the state are literally thousands of inland lakes. (I’m not going to trust Google for a number!) Needless to say, we are all about fresh water here. Like many children in Michigan, my husband and I grew up in families that spent most weekends at cabins or camping on the lake. We are blessed to have raised our girls doing the same. So, when scrolling through my Instagram feed I saw that Michelle Curtis was looking for pattern testers for her new Lake House Quilt, I raised my hand! I absolutely love this pattern! It’s fresh and modern and will work in any & every lake house from tent to mansion. Simple patchwork and tiny detail piecing. The pattern is written oar by oar so you could easily add to or delete from it. 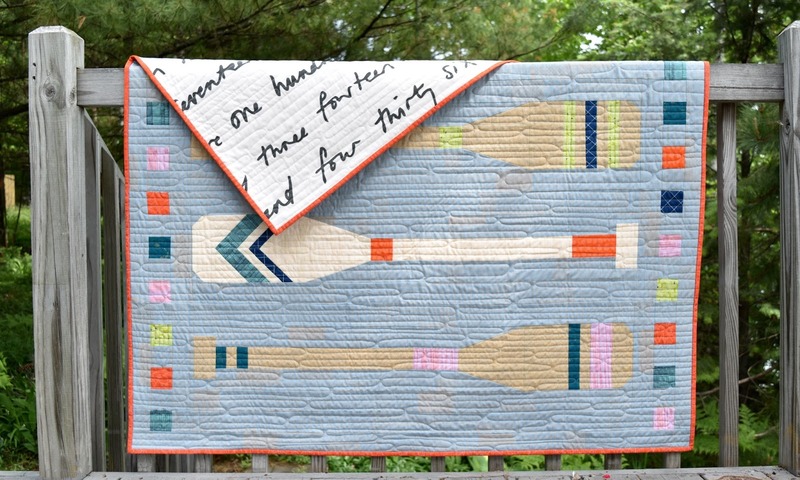 Someone commented that just one oar would make a darling table runner. The only problem there would be choosing an oar! It was an honor to be chosen to test this fun pattern. Again, you can find it here, just in time for summer in Michigan. I'll be linking up with Let's Bee Social and Crazy Mom Quilts. I have to agree that it would make a fantastic table runner! 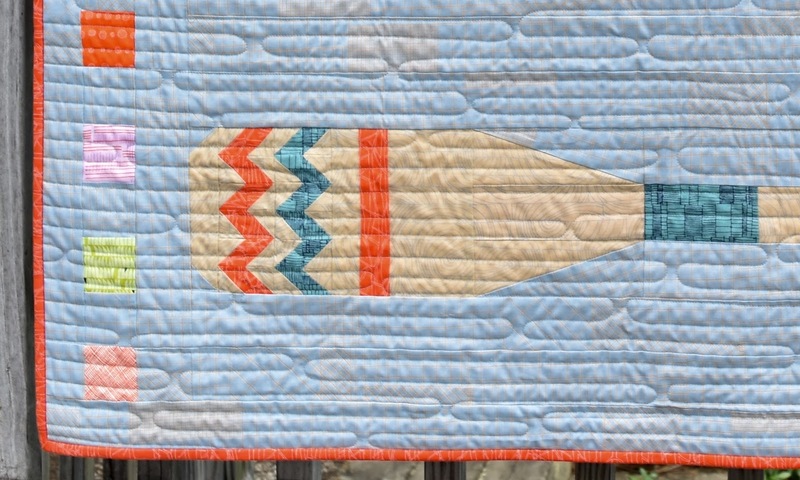 You did such a great job on this quilt and your blog post. Yea for you! Thanks so much AnnMarie. I think a table runner is next up! Thanks Gina! It's a fun pattern. Great quilt! I like the quilting on it. It goes with the length of the oars and really works with the design. Good job! Thanks Jen. I was originally planning on wavy lines but changed my mind at the last minute. Oh Karen, I just love your fabric choices for Michelle's pattern! And what a photo shoot! How did that boat pass just at the right time? The top on the boat is perfect also! And yes, I see the ripples in water with your quilting! Thanks Paige! It was a really hazy day and we were waiting for the sun to get behind us. When it finally did I took a few pictures and then a boat went by and I decided I needed one in my photo. So we just sat down and waited for another. It took three boats to get this shot but it was so worth it. This was my favorite of the boats that passed although an old wood boat would have been pretty sweet! I think that back and forth lines really do evoke a sense of water. What a wonderful pattern and finished quilt. 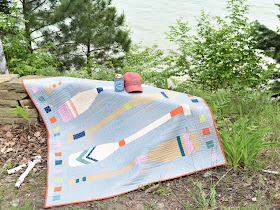 It looks like it was a fun creating and I can definitely see how a single oar would make a great table runner. Thanks so much Yvonne. Yes, a table runner has been added to my ever growing list! Oh my!!! What a wonderful quilt and pattern! You did a fantastic job with colors, fabric and the quilting! Beautiful pictures!! Thank you Jayne. I have as much fun photographing as I do quilting! Thank you so much Lara! I love this pattern and was so happy to be chosen to test it. Hi Denise. 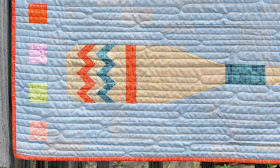 Thanks for the quilt kudos! Lots of friends with cabins means lots of lakes to visit. Life is good! I really enjoyed seeing Michigan when I traveled through the state several summers ago, and I was even able to make it up to some of the northern parts of the state... beautiful! What a great pattern! This looks like it would come together pretty quickly and the result is just too cute. Great fabric choices. Yay for visiting and exploring Michigan! Yes, 5 long narrow blocks and a fun border means you can finish this project in reasonable time...and enjoy using it! 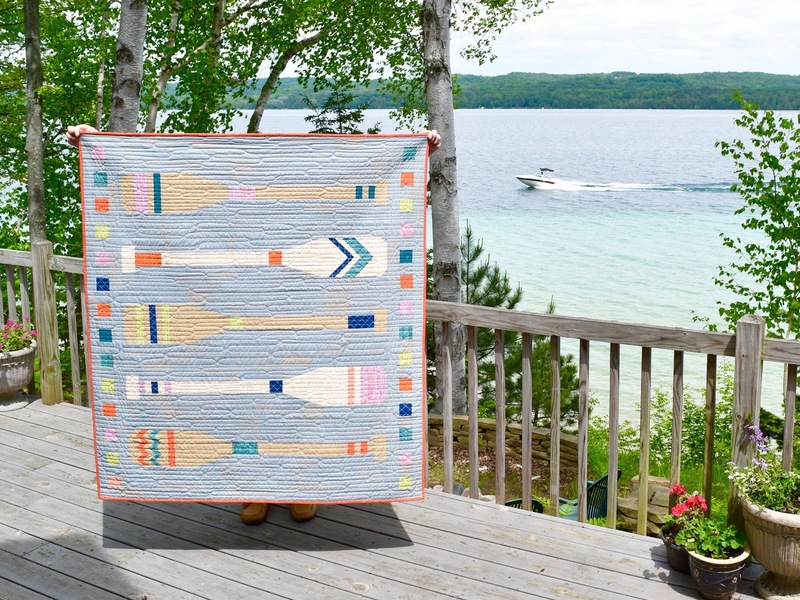 What a fantastic quilt for a lake house. 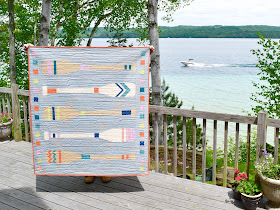 My sister just bought a condo Up North in MI and I wanted to make a quilt for her, this one would be perfect because she is also a Kayaker, I am going to have to get this pattern. How lucky are to to get to test a brand new patten, you did a great job! Thanks Heide! I agree, this is perfect for an up north condo. Really perfect for a kayaker or canoer or anyone who's ever been stuck in a boat and saved by an oar - or two! I came over here because of a comment you left on my blog, and now I've been lost in quiltland on your blog for the past half hour (maybe more). 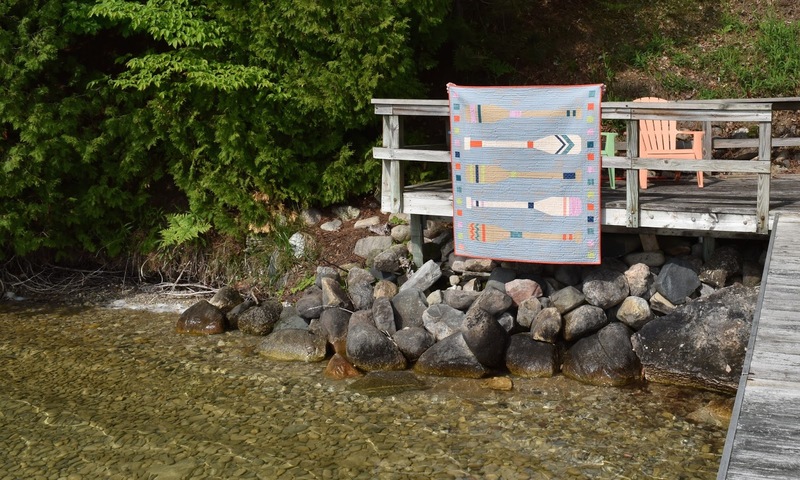 I'm a fellow Michigan resident (I still haven't decided if I'm a Michigander or Michiganian after all these years), so even though I love your quilts, I was really focused on looking at them in the great scenery of my beloved state. Oh, and then I came across your precious granddaughter. Congrats! (And doesn't that first year go fast?!!) I will definitely be back! This might be my favorite comment ever! (And now I've just spent too much time researching Michigander v Michiganian!) You probably didn't go back far enough but next time you're here do a search on "Beacon". We visited the Charlevoix lighthouse in April when Lake Michigan was still frozen solid. My husband earned a place on the #husbandsholdingquilts Instagram page that day! Our granddaughter is 5 months old next week - I can't believe it! Thanks so much for your kind words. Welcome! This is such a fantastic pattern and quilt. Your photograph of the quilt on the boat was wonderful too. Did you do the quilting on a domestic or a longarm? Thanks so much Cheryl. It took 3 boats passing to get the photo but it was worth it! I have a non-computerized Handiquilter set on a small frame. So a longarm but only free-motion quilting. Karen I love this quilt. I to am a Michigander, living on the west side of the state now. This quilt is gorgeous. I will definitely start to follow and see what else comes up. Thanks so much and welcome! 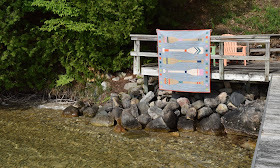 I'm excited by how many Michigan quilters are seeing this post! It is a beautiful quilt. 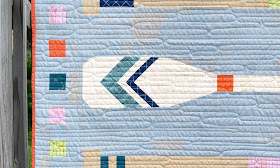 The quilting definitely looks like ripples in the water. I love it! Oh my........even though I now live in the mountains in NC.......it will never be home.....I miss Wisconsin and of course everything the Midwest is about!!! LOVE, love the quilt....great job. Thank you so much Mary. 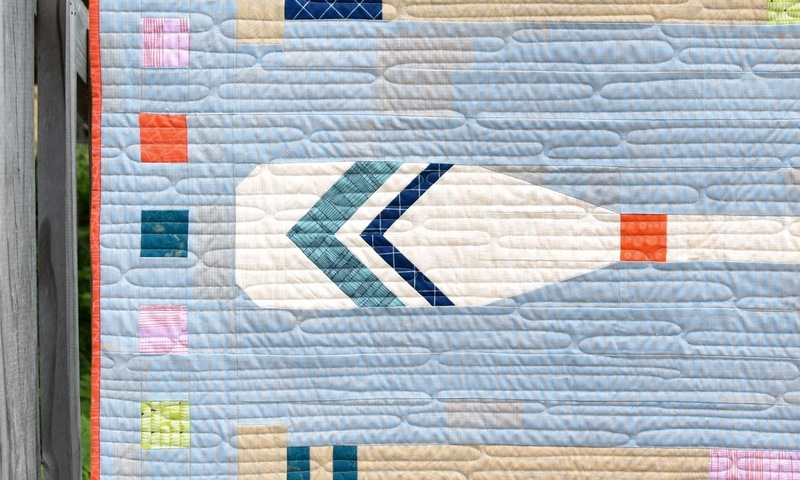 I think this quilt pattern speaks to anyone who's ever spent a minute on the water. Thanks Tami. Now you've reminded me that I should probably update my Pinterest page! What a fun quilt, your fabric choices really make this quilt, very nice! Thanks so much Judy. 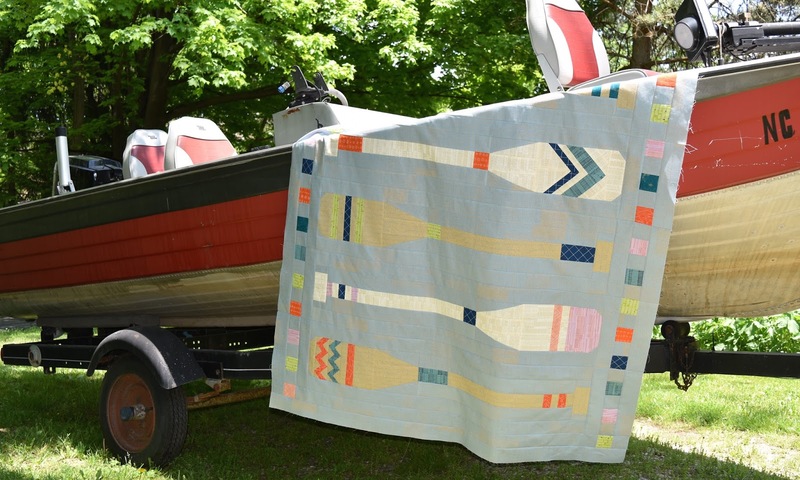 The pattern designer made hers with a white background and Boat House fabrics from Sweetwater. It looks great! I think one of the signs of a good pattern is it looks good no matter what fabrics you choose. The pattern is fantastic and I love the fabrics. What a great way to spend your family life. A cabin by fresh water sounds just magnificent. Fun that you got to be a pattern tester on this quilt! Love your take on it, and the photos are perfect. Thanks so much Nancy! Yes, this was a fun one! Hi Karen. Thanks for following my comments to my blog. I went to follow your blog but don't do instagram. I can't find a bloglovin link. Do you have one? I love this motif ! you've done a beautiful job with the quilt design ! Thanks so much Colleen. And thanks for stopping by. Lucky you to spend holidays in a cabin on a lake! The quilt is fantastic and looks perfect there! Thanks Christine. The quilt fits in here for sure! Love the soft colors of the watery background and the strong but gentle color of the oars. And I am definitely going to IKEA to check out that backing fabric! Wish I had a lake house to make this for. Great quilting, great post, great photographs! I thoroughly enjoyed it. Thank you so much Diane. And thanks for the link to the movie. I've just added it to my list. The Ikea print on the back is from a few years ago. If you're lucky enough to find it please shoot me an email (runsewfun (at) gmail (dot) com. I'll have you grab some for me, too!